Early 1992, a German company called ISSENDORFF Mikroelektronik GmbH, started to market a building automation system based on a new hard-wired network technology and named it LCN (Local Control Network). Nowadays, most modern buildings are automated using a network of sensors and actors. The controller(s) in the network receive information about the condition of the building and the environment and regulate the outputs of the actors according to pre-programmed algorithms. The network used in building automation is often called “Installation Bus”. The term “Bus” is similar to the bus terminology in computer technology where a number of I/O devices and controllers share access on common data line(s) across the system. The bus signals are carried in buildings either on a separate signal cable in addition to the the power cable or they are incorporated into the power lines using signal modulation techniques. Apart from remote control devices or sensor connections a wireless medium is not used in commercial buildings due to the interference problems. The three mostly used installation buses world-wide are EIB, LonWorks and LCN. The EIB standard was originally developed by Siemens and later spun off into an industrial association to promote compatibility between different manufacturers. LonWorks is the control network created by Echelon Corporation, a San Jose, California based, company. LCN is described in more detail in this article. In comparison, LCN differs from EIB by better performance and lower costs and from LonWorks by being less complex for an enhanced feature set and therefore, also by lower costs. As mentioned above, building management systems often use an extra cable. LCN goes a different way: it just uses an extra wire on the standard power cable. This simplifies installation greatly and helps in converting conventional installations to bus systems. LCN is a multi-master installation bus: Each controller can act as a master on the bus, e.g. it has full access to any sensor and actor on the bus; the arbitration (negotiation for access) is done at the LCN protocol level. Initially designed for large commercial and industrial buildings, LCN was developed to provide flexibility to grow from a single-room system into a multi-story building automation system without compromising solid reliability. Over time, LCN has proven itself to be suitable for a building structure of any size and not just for the large-scale ones, mainly, thanks to its technical and economical performance. A simple wiring method is one part of the characteristics of the LCN, but that is not the only factor that makes LCN a superior system: The combination of a simple wiring method, a mesh network topology, a highly reliable network protocol and software in each of the intelligent nodes in the network make the LCN system differ from the rest. To make it easy for electricians to install LCN, the system uses ordinary electrical cables only – which electricians already know how to work with. No special wire such as twisted pair or coaxial cable is required as needed in some other building automation systems. The only requirement is that the electric cable has one extra wire that will be used as the data wire to build up the network. Wiring is done just as in the conventional wiring method, e.g. lights and lighting fixtures and other electrical devices such a motors, heater, air condition, motorized windows, etc. must be connected with electrical power as usual, but using the cable with the extra wire specified above. Note that no switches will be needed to be wired as done in the conventional wiring method. This simplifies the wiring and substantially reduces the amount of cable needed. A number of intelligent LCN modules are attached to the wiring to perform automation tasks, e.g. turning on/off devices or dimming based on certain interior or exterior conditions such as temperature, daylight and time of the day. Switches and sensors for temperature, light, room occupancy, rain, wind speed, etc. can be plugged into the intelligent modules and be recognized by the system. Each of the intelligent modules, called “bus module”, is equipped with a microprocessor and can perform pre-programmed functions in stand-alone mode (e.g. without having to be connected to any other module). Bus modules have power outputs to drive electrical loads (with dimming) and have sensor inputs to be connected to a large variety of plug-and-play sensors to reach the goal of the automation project. They also have inputs for switches, IR receivers, binary signals, etc. The power supply is taken from the power line cable directly, therefore, no extra power supply unit is needed. The art of miniaturization is that good that the standard module, the LCN-UPP, fits in the wall box behind the switch or receptacle mechanics. Once installed, each unit automatically locates other modules on the data line to automatically form a mesh network. The communication among these intelligent modules happens on the extra wire in the power cable as previously mentioned. These bus modules exchange messages, called “telegrams”, with each other. The telegrams are structured digital codes that contain information such as the source, destination command and status. The LCN communication protocol is simple (for speed reasons) yet sophisticated (prioritizing, grouping, broadcasting) thus allowing the whole network to function reliably as if it were a single sophisticated whole building control module. Although the speed of the communication is 9600 baud at this level, the effectiveness of the design allows real-time handling of 100 commands per second sent from one module to the other even if they are physically far apart. The reliability in the system is also based on the fact that the LCN communication protocol requires a two-way communication between modules. Any command going from one module to the other requires an acknowledgment. This does not only tell the reception of the command (other systems do it this way) - LCN also returns a function acknowledge that tells, if the command has been successfully carried out. This ensures the integrity of the system—and this is one of the reasons why this system is superior to other systems! The LCN installation can grow from a single module system to a maximum of 30,000 addressable modules just by adding new modules to the power line. However, these 30,000 bus modules cannot be put on one single bus line. In smaller houses the LCN standard bus is used, allowing up to 250 modules. This number is quite large considering that only 1..2 modules are needed per room. A 3-bedroom house would typically need only about 5-10 units for most of the lighting and control tasks. For high-rises or large complexes with several buildings, more units would be needed. In those cases, a single bus line with up to 250 modules can be coupled with up to 120 others. These are called “segments”. In a large construction project, a single segment can control one story or a wing or a building in a complex. Segments are connected together by segment couplers. The LCN protocol identifies the source and destination bus modules by their addresses (ID within its segment and segment address). Up to 30000 modules communicate directly with each other. The LCN structure, however, helps the installer to keep the layout simple and easy to understand and maintain. As mentioned, segment couplers would only be needed in large mansions or high-rise buildings or several buildings in a large commercial complexes. One of the characteristics of the LCN installation bus is that the product range is kept small to simplify handling: there are only a few basic bus modules to choose from. The modules are packed with functions - you will not find another multi-master system with more functions. In the building, the installer just activates the functions that are needed in that certain application. A large number of peripherals, sensors, load drives, relays, adaptors, etc. can be combined. This combination makes the design, planning and installations of the system simple but very flexible. 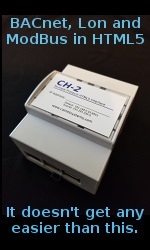 Peripherals attached to one bus module on the LCN network can be shared with any other module over the net. Practically, this kind of sharing makes the whole installation appear to have more sensors and peripherals than it really does. For example, the outside temperature sensor can be shared with the unit that controls the air conditioning system and the unit that operates windows and so allow the natural air flow to circulate in the building. Or the window-open sensor can be shared with the alarm system and the unit that operates the air conditioning. This system works more effectively and can react better to both local and global events. 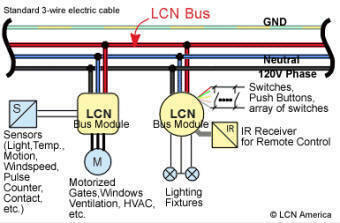 The LCN installation bus physically ties together all single modules installed throughout the building to act like one giant single module with a large number of inputs/outputs that control the whole building. The main piece that glues the functions together is the software that sets the parameters in the individual modules in order to interconnect with each other. On completion of the physical installation, the subsequent programming task utilizes a software called LCN-PRO running on a PC that taps anywhere onto the bus via a module called LCN-PC. The software automatically distributes all bus modules and their peripherals on the bus. Most of the basic programming tasks are just of the point-and-click type and none requires computer programming skills, as it is the goal of LCN to enable ordinarily trained electricians to completely handle all stages from planning, installing and programming to the finished installation. The programming capabilities are simple to master yet flexible and sophisticated. For example, some of the switches and push buttons can just be programmed to be programmed later by the users (home owners, office occupants, etc.) themselves. Users can store/recall/change complex “scenes” that they create at will. Once the system programming task has been completed, all modules work on their own. The parameters can be saved on a disk or can be read online directly from the modules. Each bus module can be protected with a password. Modules with passwords cannot be read out or re-programmed without presenting the correct password. In other typical building automation systems where a central control unit is used, a failure will cause wide-spread building control problems that are very difficult to diagnose. In contrast to that, the LCN system operates much more reliably - as there is no central controller in the middle of all the actions. Failure of any single bus module (with a life span of a minimum of 45 years @ 45°C - guaranteed by the manufacturer) only leads to local failure of anything connected to it—it does not affect the entire system. To enhance reliability even further, an overload condition is automatically detected and prevented by the firmware in the modules, long before any severe failure can occur. For electricians it is easy to locate this failed unit, just as simple as it is to locate a failed switch. The LCN installation system remains virtually maintenance-free once it is in operation. LCN bus modules are designed to bridge a power failure for up to 20 seconds without losing track of what it was currently working on. This capability helps the LCN system be resistant to problems caused by power line surges (electrical motors, capacitive loads, and weather-related effects) that plague other building control systems if not suppressed with extra equipment. Even more: LCN detects short and long power failures and offers two different ways to react to each particular situation mentioned. And in terms of recovery from a total power failure, this distributed mesh network of controllers is superior over centrally controlled systems. Each of the LCN bus modules boots up quickly when the power is restored and the whole building functions again after a few seconds. In comparison to that, a central computer needs a long boot-up time to gather the status of the building before being able to resume interrupted control tasks. One of the most important points in professional building management is the monitoring of all actions in the building. The function “receipt” (as mentioned above) is a direct answer to a command. It tells, if the function succeeded or it tells the reason, if not. The Status Message is generated automatically, if any status of the module changes, either input or output. It tells about dimming values, relay status, binary inputs, etc. These messages are available anywhere in the LCN-Bus. All modules have functions to display these, e.g. on LEDs. Additionally, there are 4 evaluation functions in each module to do complex computations. Status Commands are sent, if the status of an output changes. It can be used for follow-up functions and - combined with timers - allows complex automatic actions. All network telegrams can be monitored and logged using a PC that taps on the bus via the LCN-PC module. The monitor program can also be configured to report alarm conditions via e-mail and/or SMS or other destinations on the Internet. LCN is a trademark of ISSENDORFF GmbH in Germany and other countries.